If you’re yearning for the incredible scenery of the backcountry, look no further than Lory State Park, Poudre Canyon or Horsetooth Reservoir, all of which offer amazing snowshoeing opportunities. Just west of Fort Collins, Lory State Park has a variety of trails ranging in difficulty. Mineral Spring Gulch Trail, located in the Poudre Canyon, is perfect for beginners while Little Beaver Creek Trail is more difficult, gaining 1,500 feet in elevation. Horsetooth Mountain Open Space offers a variety of trails perfect to enjoy the snowy vistas while burning a few calories. Cross-country ski at Horsetooth Reservoir or one nearly 50 nearby Natural Areas. Fort Collins offers Insta-worthy cross-country skiing both in and around town. In town, check out the City Park Nine Golf Course, perfect for a quick jaunt for beginners. West of Fort Collins, Lory State Park has lots of trails that range in difficulty, but all offer beautiful views. Likewise, Horsetooth Reservoir, which is open year round and located west of Fort Collins, offers trails that are perfect for winter recreation. The Inlet Bay Trail, which connects the Blue Sky Trailhead and Soderberg Trailhead, includes 2.7 miles of easy trails perfect for snowshoeing or cross country skiing if snow conditions allow. Be sure to check out the Zimmerman Lake Loop Trail, popular for its typically great late season snow and some fun downhill sections. While Fort Collins is now home to an impressive 46+ Natural Areas, there are a few that are closer to the city center, making them even easier to explore come spring. Pineridge Natural Area is one of the original natural areas and features seven miles of trails, including a loop around Dixon Reservoir. Enjoy beautiful views of the city as well as the foothills. Riverbend Ponds is a popular walking, hiking and fishing spot (there are seven ponds stocked with largemouth bass, crappie and channel catfish). It’s also a gorgeous spot from which to spot more than 200 species of birds that feed, rest and nest in the area. Cattail Chorus teems with nature — especially a diverse population of birds. Look for roosting great blue herons in the cottonwoods on the west side of the natural area. Embark on a quick walk on the 0.65 miles of the paved Poudre Trail that follows the edges of the natural area. Soapstone Prairie Natural Area is an astonishing wide-open landscape spanning nearly 19,000 acres. It is home to miles-upon-miles of trails, extensive and diverse archaeological human history and rare plant and animal life. Soapstone is home to the Laramie Foothills Bison Conservation Herd, a genetically pure bison with a Yellowstone bloodline as well as endangered Black-Footed Ferrets. You can bike and hike on trails accessed from the South and North Trailheads. From the north trailhead, you can access five trails, including the popular Mahogany “lollipop” trail, a 7.4-mile loop, or the 3-mile Towhee Trail, which is open for hiking only. From the South trailhead, explore the 11.7-mile Cheyenne Rim Trail or the 7.5-mile Pronghorn Loop. Located north of the city, Red Mountain Open Space boasts more than 15 miles of multi-use trails and vistas filled with red rocks that are reminiscent of Utah’s scenery. The Bent Rock Trail is a perfect loop hike from which to appreciate these towering red canyon walls. Mountain bikers enjoy the moderate Salt Lick Trail or Sinking Sun Trail or the more difficult Cheyenne Rim Trail. From mid-May through early September, the Cache la Poudre is a true river-runner’s paradise. Not only does this nationally designated Wild and Scenic river offer stunning scenery, there are challenging rapids for every age and ability — from Class II to V. The more challenging trips feature a section of wild water with nearly continuous rapids, while more relaxing trips highlight incredible scenery with a touch of excitement in the rapids, ensuring fun for all. To keep the river wild and the experience incomparable, commercial rafting trips are limited, and there is almost no commercial development along the river’s banks. If you’re on the hunt for an adrenaline-fueled adventure, contact an experienced commercial guide to schedule a trip today. Stand Up Paddle Boarding, or SUP, in Colorado has exploded in popularity over the last few years. Because of our reservoirs, lakes, and rivers, Fort Collins plays host to some of the best SUP’ing spots in Colorado. It doesn’t matter if it’s your first time on a board or you paddle every day, there’s a spot sure to put a smile on your face. Horsetooth Reservoir is one of Colorado’s most scenic outdoor utopias, and it is located just minutes from the heart of Fort Collins. The 6.5-mile-long reservoir is a favorite recreation spot for a plethora of activities, including SUP’ing. You can rent a SUP board at the marina. The Cache la Poudre offers a different style of SUP experience –be sure to check the river conditions before you head out. There are plenty of outfitters happy to set you up with the proper equipment, offer guided and unguided trips, and give you insider tips to explore the outdoors like a local. Rock climbing at Horsetooth Reservoir is a favorite pastime. For years, climbers have used the Dakota sandstone cliffs and boulders surrounding the reservoir as training grounds for bigger routes. For roped rock climbing, Duncan’s Ridge, Rotary Park and the Torture Chamber hold the best routes. Download a free bouldering guide to Horsetooth Reservoir at www.nococlimbing.org, where you can also find information for bouldering/climbing in Poudre Canyon, including a Poudre Canyon bouldering guide, rock routes and a Poudre Falls climbing guide. The outdoor areas in and around Fort Collins are a hiker’s dream come true. Check out Horsetooth Falls for a family-friendly 2.5-mile round-trip hike west of Fort Collins in the Horsetooth Mountain Open Space. For a bit more of a challenge, head to Arthur’s Rock Trail in Lory State Park. This moderate 2-mile hike rewards hikers with incredible views of Horsetooth Reservoir and the city of Fort Collins. Greyrock, in the Cache la Poudre River Canyon, is another beloved local hike with two trail options, the moderate Meadows trail or the more challenging Summit trail. Additionally, the city’s 46+ Natural Areas, like Cathy Fromme Prairie, Gateway Natural Area and Soapstone Prairie Natural Area, offer some incredible vistas for hikers. Mountain bikers will love the miles-upon-miles of mountain biking trails, some located just minutes from downtown and plenty more in the surrounding plains and mountains. Lory State Park and Horsetooth Mountain Park are two well-known mountain bike destinations, while Red Mountain Open Space offers some intrigue. The 15,000-acre open space is adjacent to Soapstone Prairie Open Space, so hikers, bikers, and horseback riders have endless opportunities for exploration. Lory State Park also features an excellent destination for bike park buffs called The Corral Center Mountain Bike Park. The park’s old horse corrals, located southeast of the visitor center, have been converted into a 70,000-square-foot mountain bike park for riders of all abilities. The park is Colorado’s first officially state-sponsored dirt/pump track. 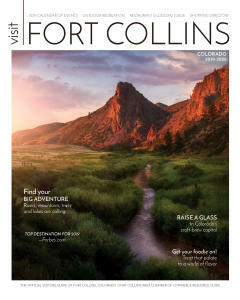 Between the Cache la Poudre River — Colorado’s only designated ‘Wild & Scenic River’ — and Horsetooth Reservoir, Fort Collins offers paradise found for fishermen and fisherwomen. The Poudre, as locals call it, is perfect for fly fishing, though there are a few spots where you can bait fish. At Horsetooth, try your hand catching smallmouth bass or walleye from the shore or a boat. Fort Collins also has 20 Natural Areas that allow fishing. With 285-miles+ of trails in Fort Collins, biking or walking the paved paths is a great way to explore the area. Snow is removed from many of the trails during the winter months as they serve as commuter routes for many residents. Getting to know the area atop two wheels offers a bounty of benefits. Road cyclists will appreciate the 285+ miles of relatively flat, wide bike lanes, trails and paths, including three main bike trails offering 19 miles of paved surface: the Poudre trail that follows the Cache La Poudre River; Spring Creek trail following the creek; and Fossil Creek trail covering miles of open prairie. The beautiful scenery found along many of these trails will likely make you forget you’re in urban Fort Collins. Don’t have a bike? Don’t worry. The Pace Fort Collins bike share program is a dockless system that allows you to bike on demand 24/7. Just because it’s winter doesn’t mean you have to stop exploring atop two wheels – just be sure your tires are oversized and ready to tackle rough terrain. Fat biking is a unique and relatively new way to experience snow-packed trails. Not sure where to explore first? Cameron Pass and Lory State Park both offer amazing fat biking opportunities. If you would like a little guidance on your first adventure, Fort Collins-based Front Range Ride Guides is ready to take you on your first fat-bike adventure. Skating outdoors is a fun experience to add to your winter bucket list. Enjoy natural ice-skating at City Park, where you can find a safe skating area on part of Sheldon Lake during those extra chilly days. Prospect Ponds Natural Area also offers a zoned-off section on one of the ponds off of Sharp Point Drive when the ice is thick enough. Watch for signs from the city’s Natural Areas department. You may also practice those spirals and toe loops at the Old Town Square Ice Skating Rink, open Fridays through Sundays (extended holiday hours) November through early Feb. each winter. The Shops at Foothills is another great option when it comes to ice skating. The Pond, located on the East Lawn at the Foothills Mall, is a stunningly beautiful area that includes a tree covered in lights, making for quite the night time skating experience.